It was Tuesday night on March 22 at 8pm when the other partners cancelled. 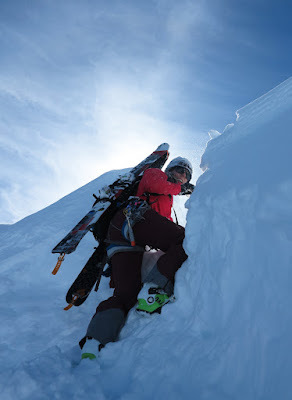 Anna Segal hesitated on our heli booking. I was at the Whistler Museum giving a presentation on 'Group Dynamics.' My text to Anna read, "I'm still in." 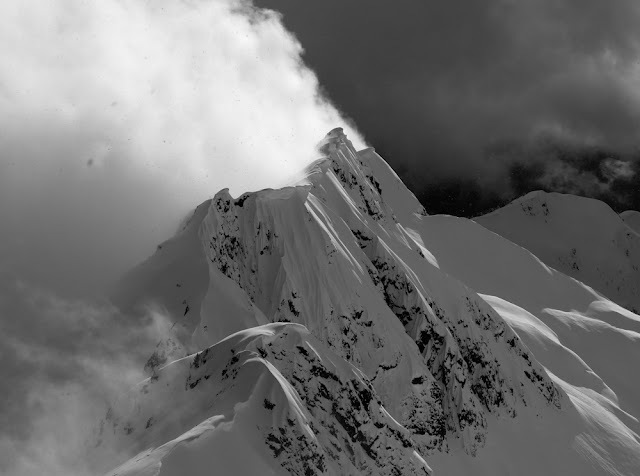 Within ten minutes two women, Julie Cossette and Catherine Henry, were recruited from the audience and our group into the Tantalus Range was back on track. 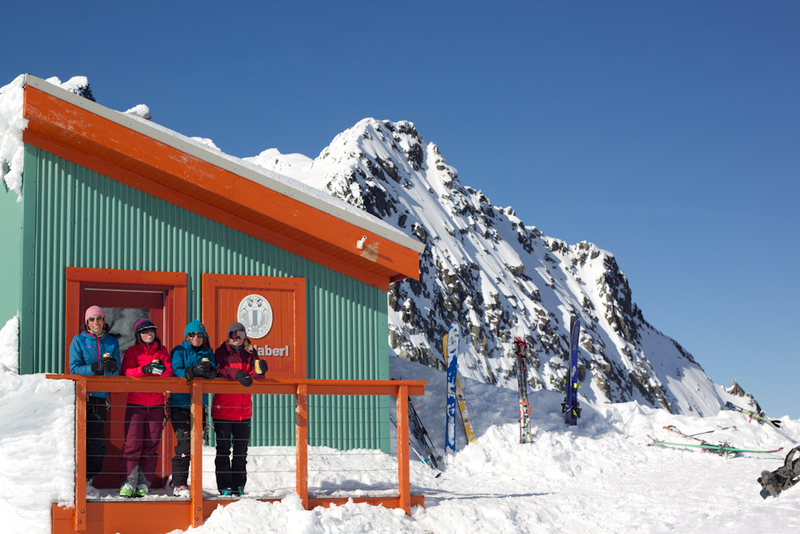 The weather was clearing super early on Wednesday with over 30 cm of fresh snow. 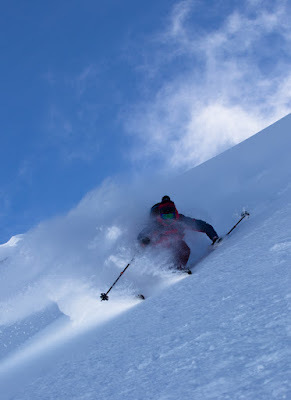 Wind was minimal in the high alpine and avalanche conditions were 'moderate' with a right side up consolidated snowpack. Conditions were as ideal as they get in the big mountains just across the Squamish River from Highway 99. 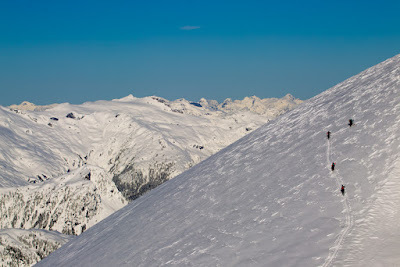 The new team rallied, leaving Whistler by 6am to arrive at the Black Tusk Heliport by 6:50am. We loaded the heli at 7:30am and the clouds cleared as we landed at the Alpine Club of Canada Jim Habrel Hut at 2,030m on the Serratus-Dione Col.
Day 1: Holly, Julie, Catherine and Anna make a quick route plan before heading out. 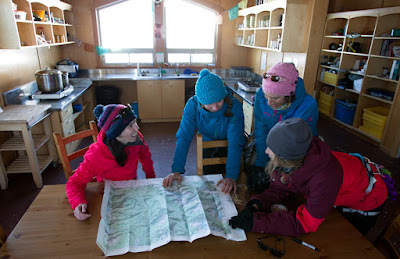 As the ladies and I dug out the Habrel Hut and made our way into the kitchen, we were shocked. "Are we really the first ones here?" asked Julie. We had beaten the arrival of the Salomon Mountain Collective and the French Canadian crew, whom were all arriving to film and ski big lines. We pulled out the map, pointed at Serratus Mountain, established the game plan, dressed in our mountaineering kit, grabbed our skis and ventured into the crevasse filled Tantalus Range. 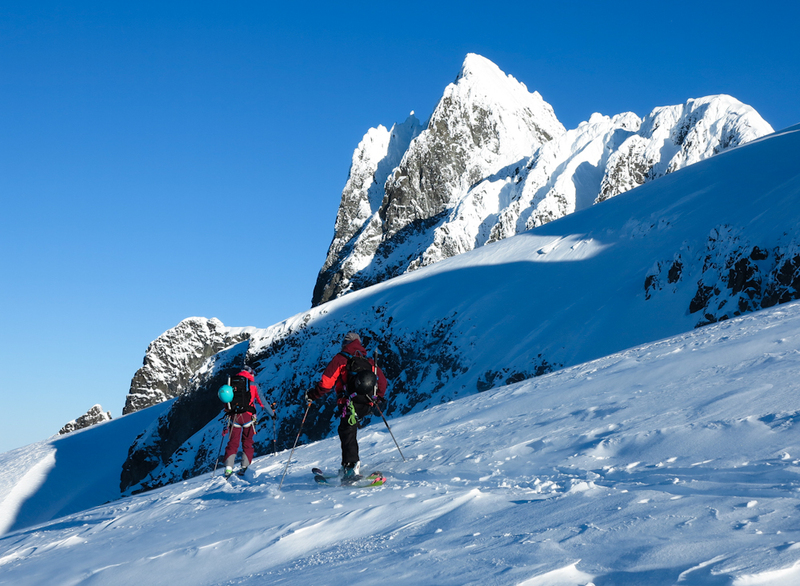 Group assesses the North Face of Serratus Mountain before choosing an ascent route. 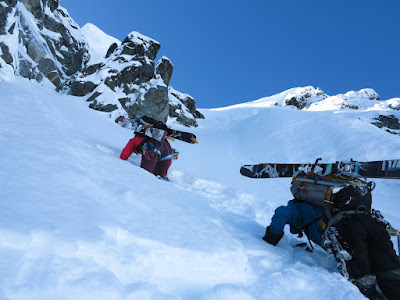 Holly and Julie sink in deep POW while placing the bootpack. Julie lead the charge, placing the skin track and most of the bootpack, claiming it was good exercise. As we topped out on the narrow ridge, the sound of another helicopter landed in the distance. We were no longer alone in the Tantalus Range. 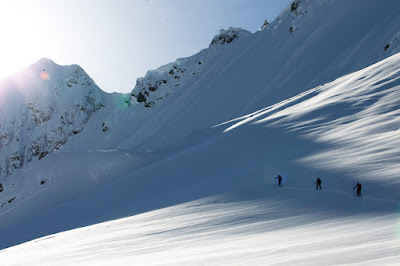 And as we dropped and skied down the steep couloir and into the open slope, we rejoiced in our discovery of perfect pow. We all smiled at having first tracks and all time conditions. Julie carved out a hole for Holly (above) and the others into the cornice. Day 2: Early morning ascent of the SW side of Mount Dione. The next morning, Thursday, was a scramble. At 6am, we ate breakfast quickly with the Salomon boys in the Habrel Hut and discussed the days objectives. They also had lined up to ski Mount Dione. We decided to steer clear of the Salomon drones, filmers and photographers and headed to the far NE side of the mountain. 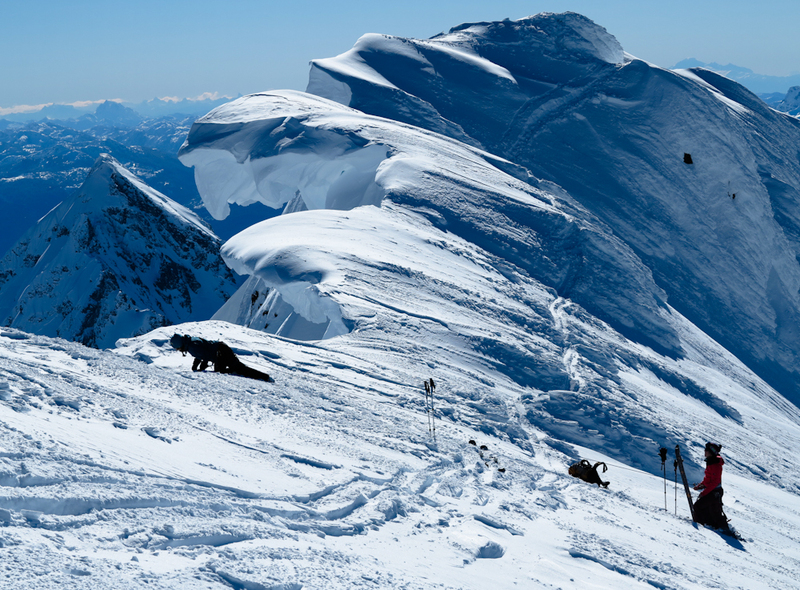 As we skinned up towards the ridge, another helicopter landed about 100 metres from our planned ski descent. Then another helicopter landed. Ski mountaineers of the Sea-to-Sky area had heard the rumours and seen Instagram posts of epic powder in the Tantalus Range and they were now arriving for the day in teams of six via helicopters. Anna and I shrugged at each other. "At least we had Wednesday," I said with a smile. Holly and Anna continue touring up Mount Dione. Dropping… Holly finds wind buffed snow down the Dione steeps. Catherine, Julie, Anna and I retreated back to the Habrel Hut by 5pm to enjoy a beer, dig out the outhouse and clean the hut for future guests before the helicopter returned to fly us back to civilization. 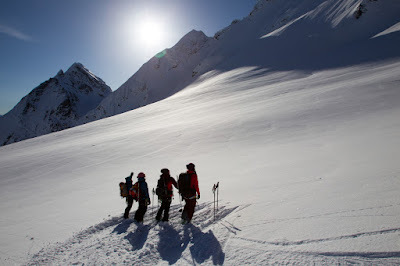 We cheers to celebrate the two days of epic powder and our ability to share the big mountain range with other visitors. After all, no one owns the mountains… We all just get a little selfish sometimes. Awaiting the heli pickup at the ACC Jim Habrel Hut. 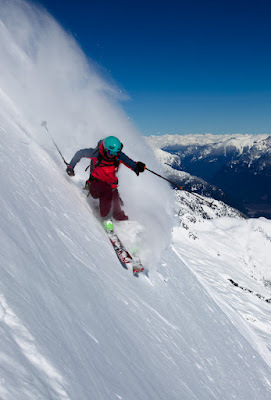 Skier and writer Holly Walker lives in Whistler when she in not traveling in search of perfect pow. Sponsors include Mammut, Clif Bar, K2 and Donjoy Performance.